G.P. Putnam's Sons Books for Young Readers, 9780399175909, 336pp. Jack is a prankster who bucks the system every chance he gets—each transgression getting riskier and riskier. He loves the thrill, and each adventure allows a little release because his smug smile and suave demeanor in the face of authority doesn’t make life at home with his mom any less tough. He tries to take care of her, but the truth is he's powerless in the face of her fragile mental health. So he copes in his own way, by defacing public property and pulling elaborate pranks, though he knows in the end this’ll only screw up his life even more. As they both try not to let their self-destructive patterns get the best of them, Tessa and Jack gravitate toward one another, discovering the best parts of themselves in the process. An honest portrayal of the urges that drive us and finding the strength to overcome them, Ripple is a stunning debut from a powerful new voice. Heather Smith Meloche has had the honor of winning the Katherine Paterson Prize and the Writer’s Digest national competition for her children’s and young adult writing. She studied video production and poetry at Michigan State University, and then earned her master’s in teaching English as a second language at Bowling Green State University. She spends her days with her family in her home in Michigan, sampling a wide variety of chocolate, letting her dogs in and out constantly, and writing and reading as much as she can. 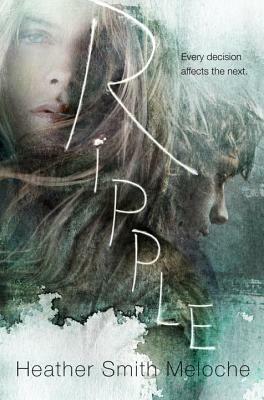 Ripple is her debut novel.